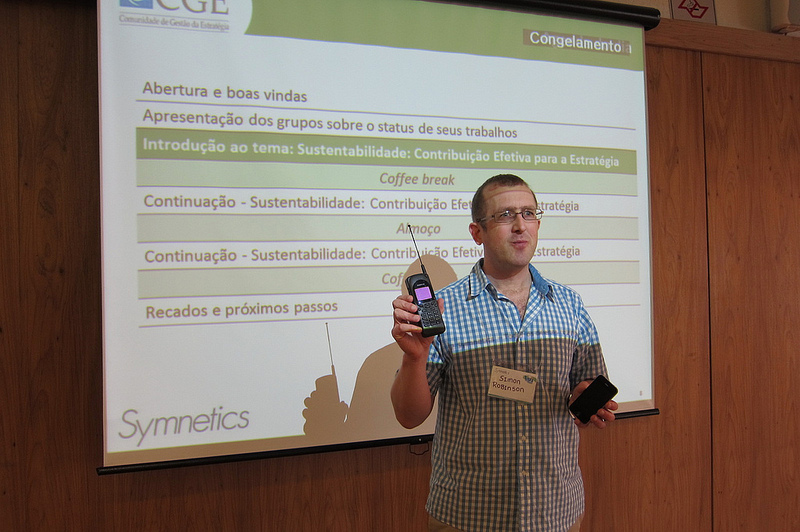 In this article I will discuss the workshop I helped facilitate yesterday in São Paulo on sustainability. The workshop was one of the bi-monthly meetings of the Community of Strategic Management (Comunidade de Gestão da Estratégia) which I described in Part One. 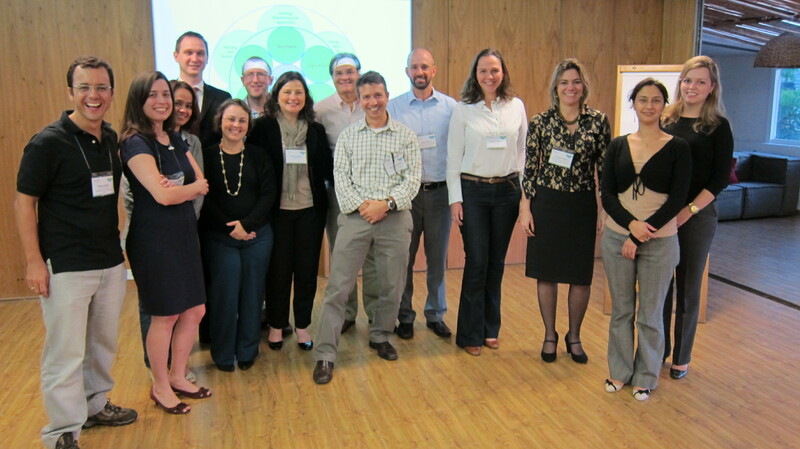 The participants of this workshop were all executives responsible for business strategy in some of the largest companies in Brazil, and therefore the objective was focussed on the development and implementation of sustainable business strategies, processes and metrics. As an expert in sustainability Maria had invited me along to both present on sustainability, and also help facilitate group discussions on the subject. But she also brought me along as I am someone who does not just focus on tools and methodologies. I teach sustainability along side, and integrated with, complexity science, innovation and creativity, and most of the time as I think holistically I am unable to separate and partition these into different subjects. I began the day by saying that we can not solve problems at the same level of consciousness that created them. These words are easy to say, and are often quoted, but it is much harder to point to what a higher level of consciousness is, let alone actually engender one in people. For me therefore if we are to live sustainably on our planet, we very much do need go undergo a transition of consciousness, and this is what we focussed on in the morning. For it is only entering into a deeper and more profound level of consciousness that we are able to grasp new insights, and new ways of thinking that will in fact lead to us solving our problems with create insight and vision. Many members of the community now know each other well, and are relaxed and very open to new ideas and new thinking. As Maria began the opening session, allowing participants to review their progress over the last couple of months, I felt far more relaxed than I had been feeling the night before, as I wanted to dosomething that for a business is quite radical. I wanted to begin with a short meditation. I asked everyone to close their eyes, and then breathe in deep and slowly through their noses, and then out of their mouths. I whistled a whistle that I do, a short refrain four times. I then asked everyone to open their eyes and the whole energy of the group was now where I wanted it to be for me to introduce the themes of the day. I wanted to explain the difference between complicated and complex systems, and as there was a plant on a table nearby, and I took it and placed it along side my old Nokia 2110 mobile phone, my first mobile phone from 1992/1993 which is still working, and a brand new Apple iPhone. I made the point that my Nokia was complicated, since although you had to have expert knowledge to understand the functioning, it was in fact possible to do so. Although the last 20 years have seen a huge amount of technological progress, the Apple iPhone can still be thought of complicated, since it too is a piece of technology which although requiring expert knowledge, can still be fully understood. I then referred to the plant, and said that there are in fact some plants where you can take a small piece of say a stem or leaf, plant that in a new location, and an entire new plant will grow. Take one piece out of the phone circuitry and it will fail. There is something fundamentally different about the organisation of a plant, whereby the whole is contained within the parts. The thinking that has got us from the 2110 to the iPhone is not the same type of thinking that we need to understand a complex dynamic and organic living plant. But many people in business are now discovering that the same organisational principles that are required to understand the plant can now be used to understand their own organisations, organisations which are also living dynamic systems, and not just fixed hierarchical structures. So why the meditation? Well in order to understand the dynamic principles of the plant, we cannot do so with our rational logical and analytical minds. In order to really know a plant, we need to use all our faculties of knowing. We need to be able to really see the plant in a way in which is not affected by our theories of what we should be seeing. We need to be able to feel a connection to the plant, feel a connection to nature and ecosystems, and really feel complexity. 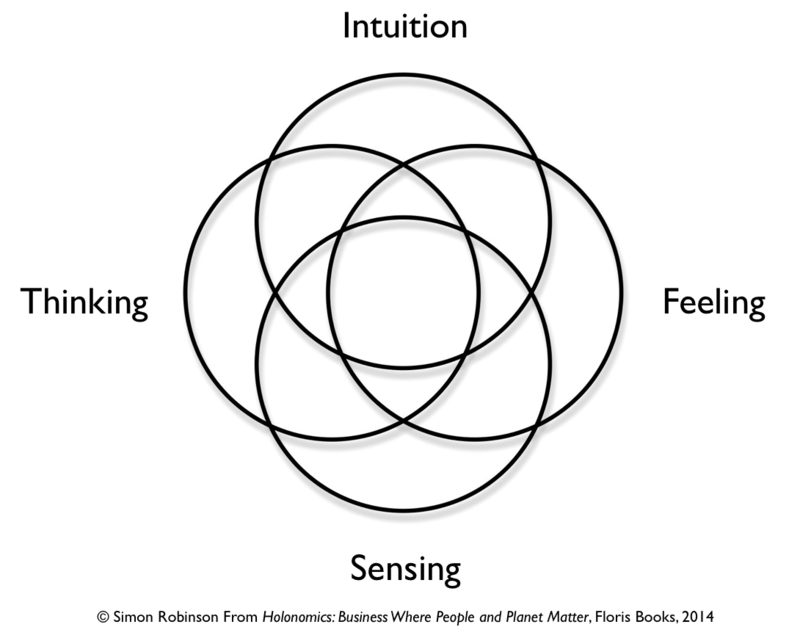 Without this feeling for complexity, and a feeling of connection, we will not be motivated to act and work in different ways. And finally, the organising principles of the plant can only be understood in our intuitive minds, since to understand the plant requires non-euclidean thinking, a dynamic way of thinking that enables us to see what Henri Bortoft calls the intrinsic dimension of the plant. I will not explain what the intrinsic dimension of one means in this blog, the main point being here that we in the west can be caught in the trap of left-hemisphere thinking, whereby we miss the wholeness of nature as comprehended in our right hemispheres, because we confuse the re-presentation of nature of the left brain with reality itself. This is explained further in a previous blog of mine looking at the work of Iain McGilchrist. Another reason for doing a meditation is that in dealing with sustainability, we are forced to consider the actions that we as humans are having on our planet, and this includes destructive behaviour. It can be so distressing for some people, that they react negatively and either withdraw from the conversation, or as psychologist Tim Kasser points out, result in even more consumption as a compensatory factor to feel good about ourselves. In addition, the challenges we face can also seem insurmountable even though we understand the need for change and transition. What I said to the group is that what I help people do is find wisdom in their heads, love in their hearts, and power in the solar plexus. This is a powerful way of thinking about ourselves internally, since it is only really the combination of wisdom, the ability to comprehend the long-term results of our actions, love, human values and respect for our planet and all living beings on earth, and power, a sense of self-esteem and personal empowerment, which will result in us being able to initiate change first in our own lives, and then in our organisations and communities. So that was how I set the themes for the day. Sustainability in all its dimensions. To summarise, I said to the group that I wanted to be able to i) really explore new ways of thinking, ii) facilitate their own discussions, iii) provide practical information and help them develop plans of action, iv) answer the many questions they would have throughout the day. In the third part of this series of articles I will explore two or three of the activities we did with the group, and how these helped lead them into a much deeper way of comprehending sustainability.